...Photographic Ramblings...: Large Space, Large Plane! ~ Exploration Thursday! 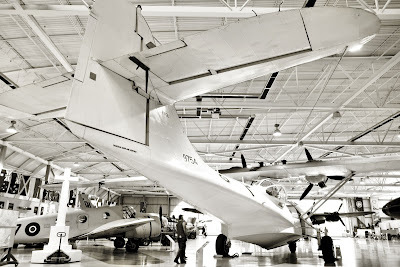 "Presenting The Catalina PBY-5A Canso"
I have a pressing need to go back to the Canadian Warplane Heritage Museum over the holidays at some point. I had such a blast photographing all the aircraft there, and the overwhelming space as well. The hanger really can become it's own character in each shot if you so choose. That always intrigues me. What will happen though is I'm renting either an ultra-wide, or fisheye lens... and would love to hear which one you think I should go with? Here's the thing... I don't think my nice little 18-55mm is doing the space justice. I did my best, getting low to the floor, using various aviation-type details to emphasize the perspective, the height, the vast space, all those cool lines... but I still think I could go much wider. And I'm torn between the two. I realize the easiest thing would be to rent both but I'll have enough to do adjusting to using one never mind two new lenses. Anyways, the shot above was my first attempt trying to convey how large and beautiful the space was, and also how big the Catalina was, looking out over all the rest of the aircraft parked within the hanger. The guy walking up to the plane also helps with the scale of everything. Ultra-wide angle? Fisheye lens? And hey, if you'd like to join me for a morning of photographing these amazing machines, drop me a line and let me know! It'll be around the first week of January! Thanks for the ramble! Have an awesome day gang! Nice image Christine, I see your dilemma though. Using the fisheye would bring a really wide,but amazingly fun aspect to the whole thing. The ultrawide would give you more of what you are actually trying to capture if it's the size and expanse of everything. You could also keep using your 18-55 and get some tighter shots of the cool details too. Thanks Rachel for your thoughts on this... I am leaning towards the ultra wide too. Knowing of course that different gear isn't going to get me instantly better photos, I just want to try them out in such a cool space, just in case readers think I'm alluding to that, lol. I do have some interesting detail shots already on the blog from earlier. They would have been posted in October I think if you want to have a look sometime :) But I DO want more!! !